This handsome and very well made PLATINUM mounting, dates from the 1960's. The graceful styling is known as "Ballerina". 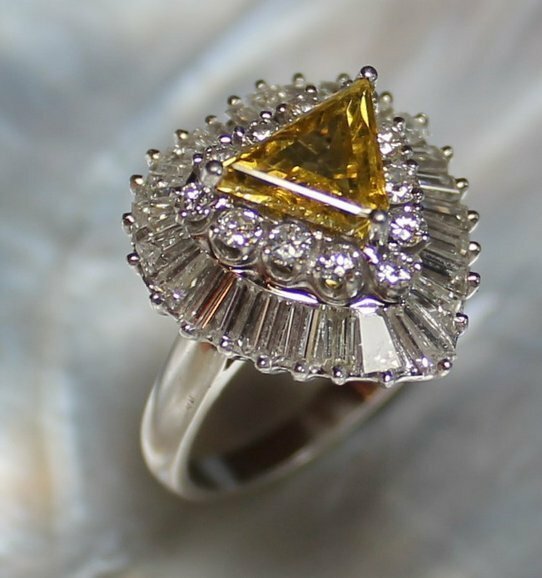 The triangular shaped yellow diamond in the center was estimated by the well respected certified GIA Gemologist in Huntington Beach, California, who appraised it back in 1974, to weigh 2.0 carats. He identified the triangular shaped stone as being a natural, Fancy Canary Yellow diamond having SI-1 clarity. We note that the yellow diamond triangle has a small chip at the point, which appears original to the piece. This is not visible to the naked eye, nor does it pose a danger to the diamond's stability within the mounting. 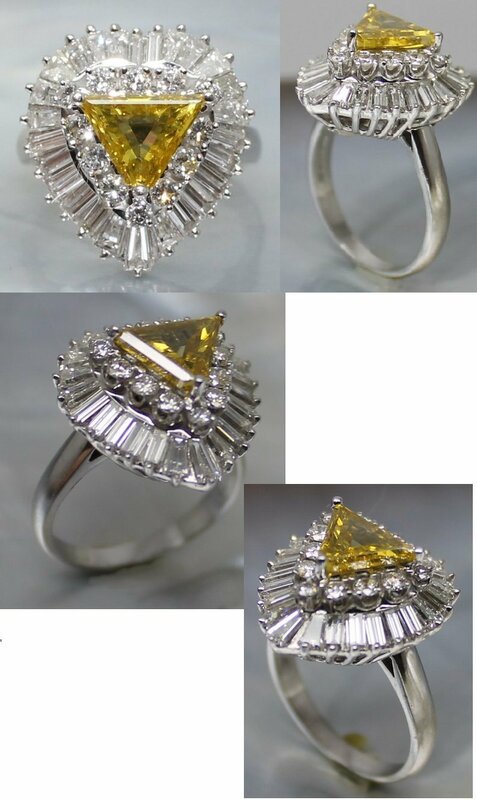 The yellow diamond is an antique, with a triangular shaped open culet. 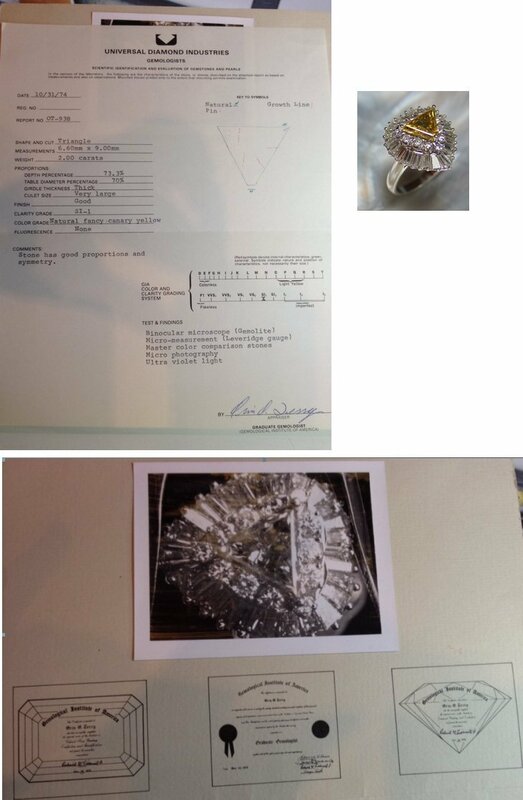 (apologies, we just noted that there is a bit of lint from the polishing cloth which can be seen on that particular photo)..The surrounding stones, a combination of round and baguette cut diamonds were estimated by the appraiser to weigh approximately 2.44 carats and he has graded them as having very fine VVS to VS clarity with top white F - H color. The piece was appraised for $7730. forty one years ago. 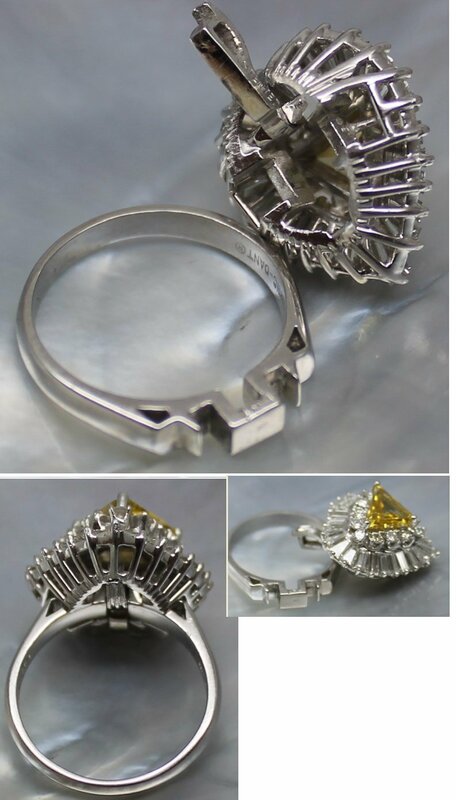 This is a decidedly unique design, allowing the owner to wear the piece as either a lavish diamond cocktail ring or to detach it via the cleverly designed and patented "Ring-Dant" mechanism, for use as a spectacular diamond pendant. Marked "Ring-Dant (R) and "10% IRID PLAT" inside the shank. 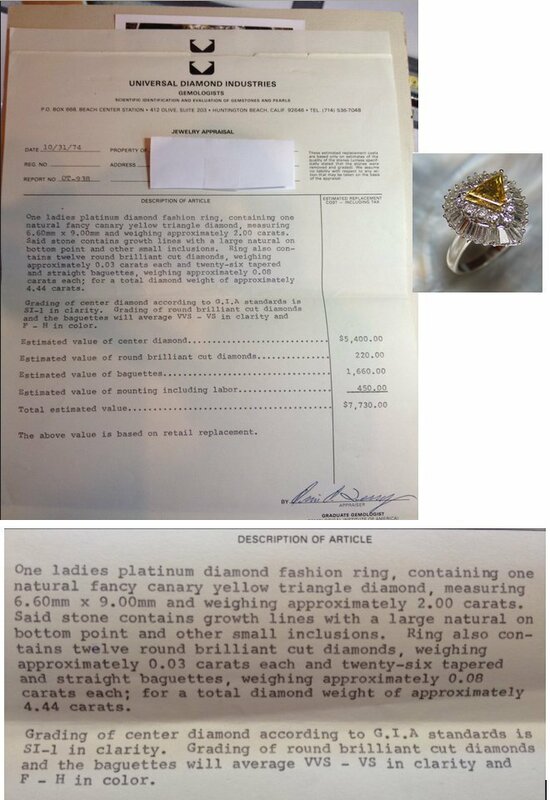 The sale of this item and other jewelry items from the same consignor are being sold to settle an estate, thus sales are final. Note: Any dark spots in photo are camera reflections only.